In the vicinity of the former Tsukiji fish market, there’s a shop selling the highest quality kitchen utensils. Hirota Yuki next to her tawashi scrubbing brush made of palm fibres, useful for cleaning vegetables. She is THE young woman of Tsujiki, the fish trading district, in what’s still very much part of a man’s world. HIRoTA yuki, whose grandfather founded this kitchen utensil business, welcomed me into her cosy, light-filled little shop. Since the relocation of the famous fish market to Toyosu, the character of the place has changed; it’s no longer the reserve of professional working people, but filled with tourists, mostly foreigners, a mix of Asians and Europeans, who continue to frequent the popular, bustling district, which is much closer to the capital’s centre than the new large market. This family business used only to supply only professional clients, but yuki hoped to open up this new shop to amateur cooks, so that her generation, who had lost many of the traditional cooking skills, could rediscover the world of Japanese kitchen utensils. A tawashi scrubbing brush, made from natural palm fibres, hangs outside the front of the shop. It’s very useful for cleaning dirt off vegetables without having to peel them. on the counter there’s a bowl to grind sesame seeds with instructions in Japanese and English. “I would like people to discover the flavour of freshly ground sesame. Nowadays, sesame seeds are sold in plastic sachets, but they have no taste. The raison d’être of traditional kitchen utensils is to enhance the ingredients we eat every day, and that takes longer than using so called ‘modern’ utensils,” the young woman assures us. Certainly, some traditional utensils made of wood, bamboo or copper need more care than those made by industrial processes. But here, they can be repaired or sharpened by skilled people, to guarantee they’ll last for many years. yuki spent her youth eating “junk food” like many other people. But while on a work placement with a rice producer, her eyes were opened to the authentic taste of natural products and home-made food. “Today, many foreigners are interested in Japan’s cuisine. I want to introduce these enthusiasts to the key to cooking our Japanese delicacies. with traditional utensils, even when abroad, it’s easier to recreate the taste of authentic Japanese food. And, above all, it’s pleasurable to cook using utensils made by Japanese craftspeople, isn’t it?” she adds. 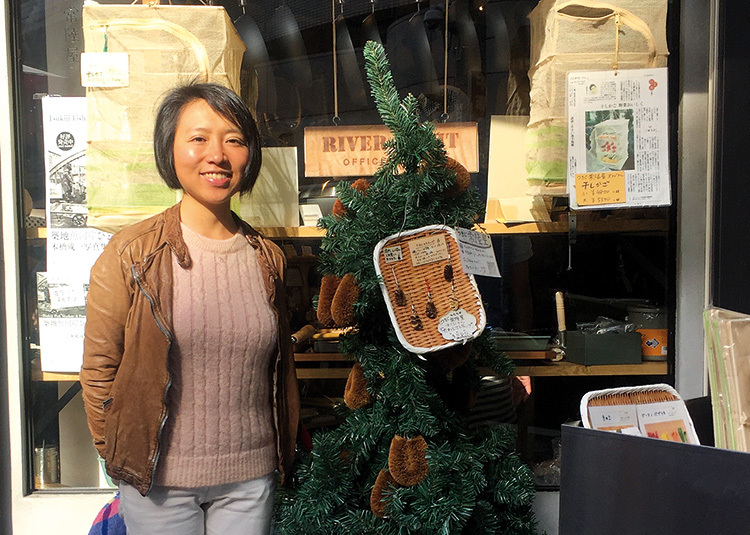 A few steps away from her shop, she has opened a cellar selling wine and natural sake where you can also find sun-dried vegetables (she’s published a book on the subject) and fermented foods… It’s an ideal place for a break to taste some hot sake or natural wine. TSUKIJI HITACHIYA, 4 chome 12-5, Tsukiji, Chuo-ku, Tokyo, 104-0045. There’s another outlet in Amakusa, in the Marugoto Nippon building.